To mark its tenth anniversary since opening as a visitor attraction, The Real Mary King’s Close is offering couples who tied the knot back in 2003 the chance to renew their vows this Valentine’s Day to the backdrop of this atmospheric Edinburgh venue. The competition, as unique as the venue itself, will be available to enter here, as well as being announced via Facebook and twitter giving couples the chance to take their romance to a whole new level as they renew their vows within the attraction’s warren of underground closes. As an attraction that tells the real stories of those who lived and worked on The Close, couples will be asked to submit their real story for their chance to win. From the hidden depths of Edinburgh’s historic past to the bright heights of Edinburgh’s Royal Mile, the winning couple will then enjoy an overnight stay including a romantic candlelit dinner at Edinburgh’s luxurious Hotel du Vin. The couple’s commitment to each other will also become part of the fabric of The Real Mary King’s Close as this historical first will be recorded and included within a tenth anniversary time-capsule which will remain in The Close for future generations to come. 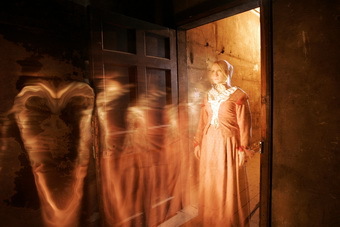 As part of its celebratory year, visitors to The Real Mary King’s Close during 2013 will be able to enjoy a programme of one off special events with highlights including a week long festival planned around Halloween. Previous PostPrevious Down to Earth with Agnes….